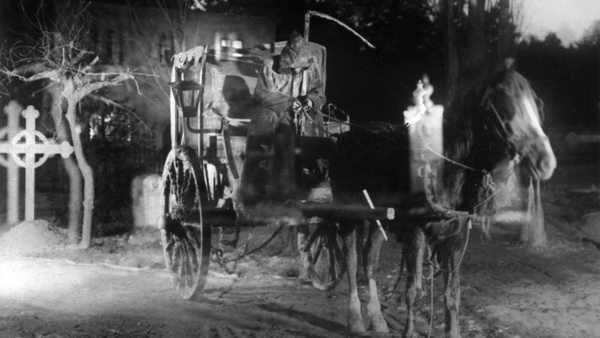 The threads of silent cinema are tightly woven into some of the greatest cinema ever made, yet few yarns are quite as bold as Victor Sjöström’s Phantom Carriage (Körkarlen). Based on a novel by Nobel laureate Selma Lagerlöf, the tale tells of the last person to die on New Year’s Eve, who as per folklore is cursed to ride Death’s carriage, collecting souls for the year ahead. The image of Death walking amongst us recurs throughout the history of the visual arts, but Sjöström brought it to cinema, in a way that still reverberates to this day. Famously echoed by Ingmar Bergman in the Seventh Seal, the troubled Swede spoke at length how Sjöström’s film grabbed him and shook him as a 12 year old boy. But it is through Sjöström’s innovative use of flashback and ghostly superimposition that his mark can be seen all the way through to film history, right up to last year’s A Ghost Story. Not without its detractors, the critic André Bazin derided the film’s use of double exposure, 25 years after the it’s original release. The comments sparked debate in Cahiers Du Cinema, and caused a new wave of French critics and filmmakers to revisit the film: a tidy 97 years after its release, this is our chance to revisit this classic film again. Presented by South West Silents in partnership with the Swedish Institute. With an introduction by Dr Peter Walsh and screening with live musical accompaniment from Stephen Horne. Defying gender norms and refusing labels, Something Must Break is an intimate and energetic picture of people looking for who they can be and are allowed to be, Watershed's MA Curation student Thea Berry writes.